There is no doubt that in the development of the Physics and Chemistry of Solids during the last fifteen years, the very important place taken by low-dimensional compounds will be remembered as a major event. Dealing very widely at the beginning with two-dimensional structures and intercalation chemistry, this theme progressively evolved as the synthesis of one-dimensional conductors increased, along with the observation of their remarkable properties. Beyond the classical separation of the traditional disciplines, essential progress has stemmed each time from the concerted efforts of, and overlapping between, chemists, experimental physicists, and theoreticians. This book is a synthetic approach which aims to retrace these united efforts. The observation and characterization of charge density waves in their static or dynamic aspects have been the main points to attract the interest of researchers. Two broad categories of compounds have been the material basis of these observa- tions: transition-metal polychalcogenides and either condensed-cluster phases or bronze-type compounds. 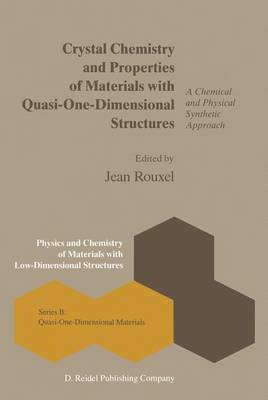 These families are referred to throughout the various chapters of this book, thus illustrating the continuous progress of concepts in this domain and, at the same time, providing the first synthetic and exhaustive view of this group of materials.